A good little app based on the famous 3 pigs and wolf story. Gets a good 4.5/5 ratings. Before you pan me for being a bad parent, I am not suggesting leave the kids with the phone/tablet - but sometimes its unavoidable (while driving etc for instance) - this could be handy for those moments. 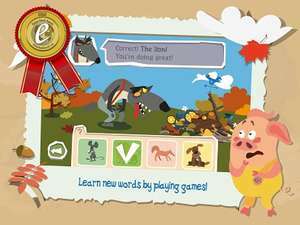 The interactive story for kids about the Three Little Pigs and the Big Bad Wolf. No adverts, no in-app purchases! Playable without Wi-Fi and Internet. Gold Medal Winner of the 2017 Global Ebook Awards. Nomination at GIGA MAUS 2017 in Germany. The Winner of „Show Your App“ Award 2017 in Germany. Known from: WDR, n-tv, COMPUTER BILD, Viel Spaß. Book Award Nominee - Independent Publisher Book Awards 2017. Nominated for "Best Mobile App Awards" in categories "Books & Reference, Education, Entertainment, Family & Children, Educational, Family". Experience the famous tale of 'The Three Little Pigs' as reimagined in our new app bursting with never-before-seen features! The app is especially for children of pre‑school to primary school age who are already learning about technology and mobile devices, and who enjoy fun and exciting fairy tales. Children are told the story in a play-filled and self-guided manner, encouraging them to create their own experiences. This is perfect! bring on story time. Is it possible to change the language to English from American "English"? There will always be situations were young kids need something to keep them entertained. I made my own app for my daughter to play on her fire tablet for that very reason. There will always be situations were young kids need something to keep …There will always be situations were young kids need something to keep them entertained.I made my own app for my daughter to play on her fire tablet for that very reason. Precisely - its for such moments that things like these come handy - it doesnt need internet either which is super handy in conditions where there isn't one.